For more than 40 years, missions throughout the solar system ave sent back stunning images of our home planet In 1990 the NASA spacecraft Voyager 1, careening across the solar system on its way to becoming the most distant human-made object in space, took a glimpse back at the planet it had left 13 years earlier. 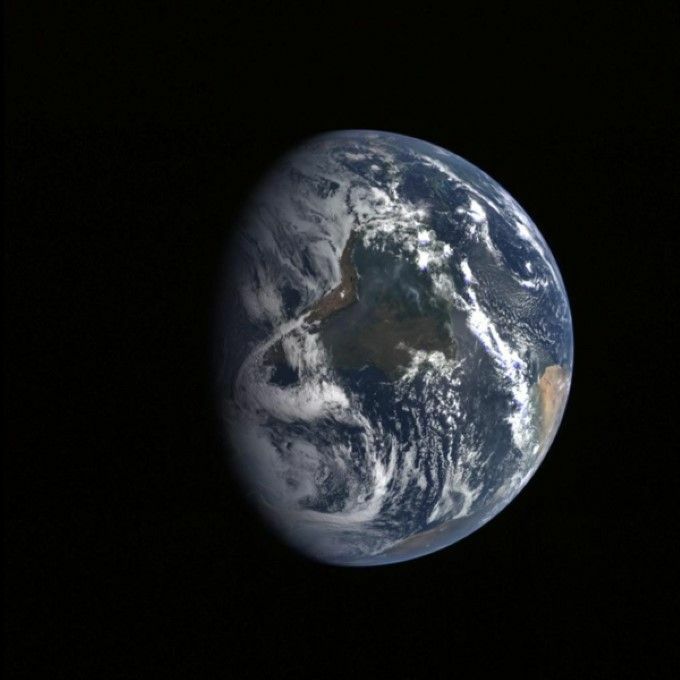 Six billion kilometers away, Earth was barely distinguishable against the backdrop of space—a “pale blue dot,” as astronomer Carl Sagan would famously dub it. Earlier this month another interplanetary explorer caught a striking glimpse of Earth, this one captured as the spacecraft, a European probe called Rosetta, approached our planet from deep space. In a third and final flyby of Earth, Rosetta tapped the planet’s gravity to adjust its own trajectory for a planned encounter with a comet in 2014. As the probe drew nearer to its home planet, just a sliver of Earth was visible, but the flyby nonetheless revealed striking detail—a swirl of clouds above Antarctica is discernible, as is highly reflective ice near the South Pole. 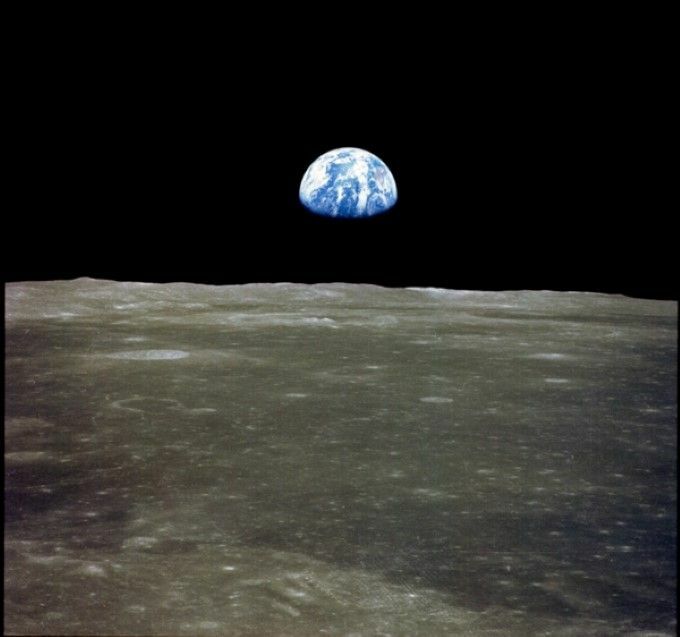 EARTHRISE: When Neil Armstrong and Buzz Aldrin touched down on the moon in July 1969, they became the first humans to view Earth from the surface of another celestial body. This image, taken during the Apollo 11 mission, shows what Armstrong and Aldrin’s home planet, some 400,000 kilometers away, must have looked like. JUST PASSING THROUGH: For sheer, high-detailed beauty, nothing beats an up-close view. NASA’s MESSENGER spacecraft, bound for Mercury, took this snapshot at a distance of 100,000 kilometers from Earth during a 2005 flyby of our planet. MESSENGER made its third flyby of Mercury in September of this year and should be the first spacecraft to enter orbit around the small, dense planet in 2011. SPYING ON THE NEIGHBORS: The Mars Reconnaissance Orbiter, perhaps best known for its high-resolution 2- and 3-D maps of the Red Planet’s surface, looked instead to the sky to take this 2007 image of Earth and the moon. The photograph is a filtered composite—the clouds on Earth were so bright in the original data as to drown out the dimmer moon. PALE BLUE DOT: As the Voyager 1 spacecraft roamed ever deeper into the solar system, astronomer Carl Sagan thought it would be worthwhile to have the NASA probe take a look back at Earth before the planet receded completely from view. “Our planet would be just a point of light, a lonely pixel, hardly distinguishable from the many other points of light Voyager could see, nearby planets and far-off suns,” Sagan recalled in his 1994 book Pale Blue Dot. “But precisely because of the obscurity of our world thus revealed, such a picture might be worth having.” In 1990 he got his wish: Voyager 1 turned to see the lonely pixel (0.12 pixel, actually), photographing Earth from six billion kilometers away. The planet is visible as a dot in the rightmost diagonal ray of light—Sagan attributes the rays to sunlight reflected off the body of the Voyager spacecraft. INDIA JOINS THE MOON CLUB: The Indian Space Research Organization scored a major coup in 2008 with the launch and successful insertion into lunar orbit of Chandrayaan 1, the nation’s first moon mission. The unmanned mission ended prematurely in August of this year when controllers lost contact with the spacecraft, but not before Chandrayaan 1 had accomplished many of its scientific goals and provided a few surprises. In September a group of scientists announced that the spacecraft’s Moon Mineralogy Mapper had detected low levels of water across the lunar surface. In the image above, taken on July 22 of this year, the Moon Mineralogy Mapper was trained on an illuminated Earth just over the lunar horizon. SPIRIT IN THE SKY: One morning in 2004, just before sunrise on Mars, the Spirit rover caught sight of the planet where its human controllers live and work. According to NASA, this mosaic of images from Spirit’s navigation camera is the first view of Earth, a white dot in the center of the panorama, from the surface of another planet. Spirit and its twin rover, Opportunity, are still at work on Mars, although Spirit is currently stuck in a patch of soft soil from which it may never escape. MAGNIFICO, GALILEO: The Galileo spacecraft took this photograph of Earth and the moon in 1992, three years after its launch and just over a week after a near-Earth flyby. 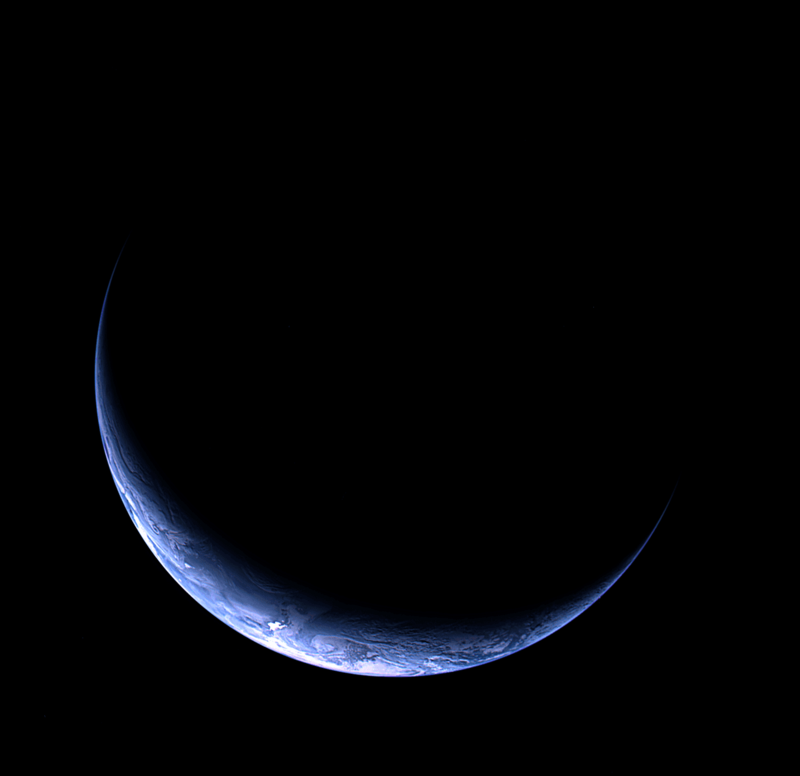 The portrait of the Earth-moon system is a composite of visible and near-infrared images. Galileo was about 6.2 million kilometers from Earth when the image above was captured; the probe was drawing away from Earth for the final time on its way to Jupiter. DWARFED BY A GIANT: The Cassini spacecraft, currently exploring the Saturnian system, caught a glimpse of Earth in 2006 at a distance of about 1.5 billion kilometers. The planet is visible as a bright dot above and to the left of Saturn’s main rings. (In the detail above left, Earth’s moon is just visible as a hazy mass to the planet’s left.) Ordinarily the sun’s glare would be too bright for Cassini to look back at its home world, but the spacecraft took advantage of a position in which Saturn stood between the probe and the sun to sneak a peek at Earth. AT FIRST SIGHT: NASA’s Lunar Orbiter 1 took this photograph, the first of Earth as seen from the vicinity of the moon, in 1966. The five unmanned Lunar Orbiter missions mapped the vast majority of the moon’s surface and scouted locations for the forthcoming Apollo missions. Forty-two years after this image was beamed back to Earth, NASA released a much higher-resolution version reprocessed from the original analog data tapes. CRESCENT EARTH: Rosetta, a European Space Agency mission to Comet 67P/Churyumov-Gerasimenko, launched in 2004 on a 10-year voyage to its cometary rendezvous. Its route to the comet includes four planetary swing-bys—three of Earth and one of Mars—for gravitational trajectory assists. Rosetta’s camera snapped this image of Earth from more than 600,000 kilometers away during its fourth and final planetary flyby in November. The sliver of Earth lit by the sun shows clouds over Antarctica, visible at the bottom of the photograph.